Have you considered spinning memories into stories, essays or memoirs? This workshop will build writing skills and insight into intentional travel! Reflect how to travel more purposefully, independently, and intentionally. Practice journal exercises (not to critique but to share if you want) to develop insight & clarity. Consider types of travel (pilgrims are not tourists) to match with journal writing supplies. Develop observation skills; build writing skills using the senses; and mix fiction with fact. Select journaling methods to match your travel circumstances and/or writing style. 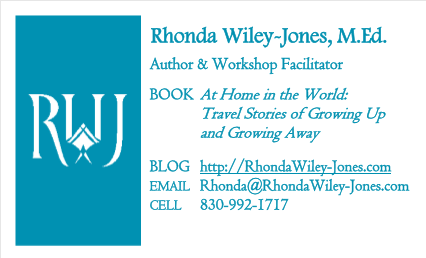 Rhonda Wiley-Jones, M.Ed., author of her travel memoir, At Home in the World: Travel Stories of Growing Up and Growing Away, is world traveler, journal writer, blogger, fiction writer. She’s conducted this workshop with audiences, such as the 2016 bi-annual Story Circle Network national conference, 2015 Schreiner University’s Global Programs, and the 2013 Schreiner University’s Innovative Learning Program.